For a guy who was a founding father in the Mersybeat movement; worked with the likes of Eric Clapton (briefly), and enjoyed a recording career that's spanned some four generations, he isn't particularly well known in either the UK, or the States. 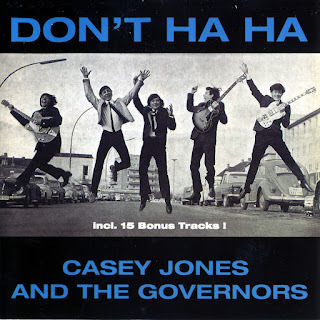 Born Brian Casser in Liverpool, England after a brief career in the merchant Navy by the late 1950s he'd supplemented his income as a cook by adopting the stage name Casey Jones and formed one of Liverpool's earliest rock bands - Cass and the Casanovas. Casser quickly discovered there was money to be made in rock and roll and by 1959 he was running one of Liverpool's first rock clubs - The Casanova Club which began booking local groups, including an early gig by the newly formed Beatles. Unfortunately, personality issues and differences in musical approaches saw The Casanovas fall apart. With Jones interested in handling lead vocals, the other three members fired him, subsequently reappearing as The Big Three. The trio quickly picked up a manager in the form of Brian Epstein, signed with Decca and began a brief recording career that included stints working as Cilla Black's backing band. For his part Jones split for London where after about a year he scored a contract with Columbia. Credited to Casey Jones & the Engineers, he made his debut with the release of 1963's 'One Way Ticket' b/w 'I'm Gonna Love You' (Columbia catalog number DB 7083). Anxious to support the single, he ended up recruiting former Roosters lead guitarist Eric Clapton and bass player Tom McGuinness, with backing from drummer Ray Stack. The band's pop orientation didn't particularly suit Clapton or McGuinness and within a matter of months they'd both tendered their notices; Clapton reappearing in John Mayall's Bluesbreakers. With a new line up consisting of lead guitarist David Coleman, rhythm guitar player Roger Cook, drummer Peter Richards, and bassist Jim Rodford Casey Jones and the Engineers soldiered on, releasing a pair of German singles on the Bellaphon label. Aware of the immense pool of musical talent in the UK and cutthroat nature of the business, Jones decided to relocate the band to West Germany where there was considerable demand for the talents of English bands. 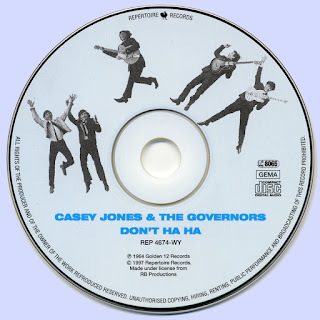 The band also opted for a modest name change - becoming Casey Jones and the Governors. The name was apparently chosen to underscore their British roots. That move proved quite shrewd with Bellaphone repackaging the two earlier singles under an EP credited to Casey Jones and the Governors. While the EP did little commercially, it attracted the attention of the Golden 12 label which signed the band and agreed to finance an album. Musically "Casey Jones and the Governors" wasn't going to change your world outlook. None of the 14 performances was bad, but without a single original composition the album found Jones and company forced to plow through a pedestrian mixture of R&B and soul chestnut covers. Showcasing Jones' somewhat goofy demeanor and mediocre voice, it was obvious these guys simply would not have been able to compete with the majority of their English competitors. That left them in an awkward position of having to try to make it on the basis of personality - not a strength that translated to vinyl particularly well. So here's the funny thing about the set ... even though there wasn't an ounce of originality in these grooves, the results were surprisingly enjoyable. Who knows why this one struck such a chord with me. Perhaps because these guys were such underdogs? Maybe because they actually showed some in-studio enthusiasm? Who knows.